Cadillac spokespeople confirmed with us Friday the Cadillac CTS Coupe will receive a 2011 model year designation, hitting dealer lots next May. 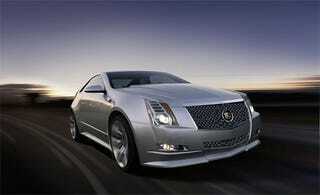 But with the two-door Cadillac receiving the same engines as the CTS sedan, whither the CTS-V Coupe? That's a good question. Whereas once we were told the CTS-V Coupe was "still being looked at," as of Friday we've been told it's not only a "go" — it's coming in May alongside the plain ol' CTS Coupe. Can someone say M6 Coupe-killer?